Houses at Auvers is an oil painting by Vincent van Gogh, painted towards the end of May or beginning of June 1890, shortly after he had moved to Auvers-sur-Oise, a small town northwest of Paris, France. His move was prompted by his dissatisfaction with the boredom and monotony of asylum life at Saint-Rémy, as well as by his emergence as an artist of some renown following Albert Aurier's celebrated January 1890 Mercure de France review of his work. In his final two months at Saint-Rémy van Gogh painted from memory a number of canvases he called "reminisces of the North", harking back to his Dutch roots. The influence of this return to the North continued at Auvers, notably in F789 The Church at Auvers. He did not, however, repeat his studies of peasant life of the sort he had made in his Nuenen period. His paintings of dwellings at Auvers encompassed a range of social domains. Vincent van Gogh spent the early 1881–1885 years of his brief ten-year career as an artist painting in the Netherlands at Etten, The Hague, Drenthe, and Nuenen (his last family home). It was in Nuenen that Vincent executed F82 The Potato Eaters, which he considered his first really successful painting, while other early paintings of the time, such as F83 The Cottage (left), attest his sympathy for peasants and their way of life. Following the death of his father in March 1885 and ensuing difficulties and quarrels with both his family and neighbors in Nuenen, Vincent moved first to Antwerp, Belgium, where he briefly studied at the Academy, and then finally joined his art dealer brother Theo in Paris, France, in March 1886. His move from Antwerp was motivated by worries about his health, suffering a breakdown early in the year. The two years he spent in Paris with his brother are the least documented of Vincent's career, simply because the main source for Vincent's life are the letters between them and, naturally, they did not correspond when together. [A] Nevertheless, there are abundant sources to show that Vincent participated fully in the artistic life of the city, although he never aligned himself with the Impressionist movement. In particular he came into contact with Paul Gauguin, whom he idolized. By the end of the two-year period, relations between the brothers had soured somewhat and Vincent resolved to leave Paris and settle in Arles in the south of France, where he conceived the project of starting an artists' commune with Gauguin. Gauguin joined Vincent at The Yellow House in October 1888. However, Vincent's erratic behavior and drunkenness alarmed Gauguin, and by Christmas he had resolved to leave. Vincent suffered a severe nervous collapse as a result and was hospitalized. Despite making a speedy recovery, Vincent voluntarily entered an asylum at Saint-Rémy-de-Provence on 9 May 1889, where he was able to continue painting between relapses of mania (his exact medical condition is not known with certainty). 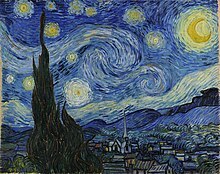 Perhaps his most loved and best known painting, F612 The Starry Night, dates from this time. It exemplifies the vigorous and agitated brush work he had developed. 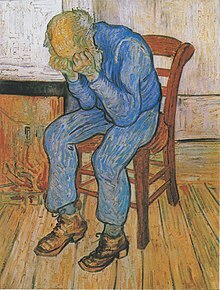 Vincent suffered his most severe relapse towards the end of February 1890. The following two months he was unable to paint, scarcely able even to write. He declared himself "totally stupified" in his single letter of this period to Theo on 17 March . [L 1] Hulsker called it the saddest period of Vincent's life. Nevertheless, Vincent was able to draw and paint a little as he recovered. He described painting a few canvases from memory, which he had experimented with in F496 Memory of the Garden at Etten (Ladies of Arles) while painting with Gauguin, in a letter to Theo dated 29 April. [L 2] He called these paintings souvenirs du nord, "reminisces of the North". He mentions he might redo F83 The Cottage (above left) and F84 The Old Church Tower at Nuenen. He is more explicit in a following letter to his mother and sister Willemien: " And while my illness was at its worst, I still painted, among other things a reminiscence of Brabant, cottages with mossy roofs and beech hedges on an autumn evening with a stormy sky, the sun setting red in reddish clouds. "[L 3] This painting is identified by the Van Gogh Museum as either F673, F674, or F675 (right). Hulsker also singles out F695 Two Peasant Women Digging in the Snow and identifies a series of sketches depicting peasants, of which F1594r is an example, as dating from this time as well. He says these works, almost alone in Vincent's entire oeuvre, show unmistakable signs of mental collapse. Finally he notes that F702: Worn Out – At Eternity's Gate, which Vincent made at this time, is likewise an unmistakable remembrance of times long past. The original was a drawing Vincent had made in The Hague. Vincent ascribed this latest relapse to the boredom and monotony of life at the asylum. For months he had been writing Theo saying he wanted to leave the asylum. He felt sure that if he moved back to Paris he would get well quickly. [L 4] At the same time Vincent had become something of a celebrity in the art world following a very favorable review of his work by the critic Albert Aurier, who declared him a genius. Despite his misgivings, Theo followed advice proffered by Camille Pissarro and arranged for Vincent to work at the village of Auvers-sur-Oise north of Paris under the supervision of Paul Ferdinand Gachet, a doctor. Auvers-sur-Oise was a medieval town about 15 miles northwest of the center of Paris. It was only a few roads wide, but extended for miles along the river in both directions, vineyards and market gardens scattered all along its length. Its hamlets were a mix of clusters of thatched houses and farm enclosures. The French painter Charles-François Daubigny first moored his studio barge Botin there in the 1850s, and later purchased no less than three houses in the village as well as another nearby. With the advent of a railway, the town became a tourist center, its population swelling from 2,000 to 3,000 in the summer months. It attracted artists such as Corot, Cezanne and Pissarro, all seeking to capture its rustic charms. Dealers like Theo van Gogh sold thousand of their images. Here we’re far enough from Paris for it to be the real countryside, but nevertheless, how changed since Daubigny. But not changed in an unpleasant way, there are many villas and various modern and middle-class dwellings, very jolly, sunny and covered with flowers. That in an almost lush countryside, just at this moment of the development of a new society in the old one, has nothing disagreeable about it; there’s a lot of well-being in the air. I see or think I see a calm there à la Puvis de Chavannes, no factories, but beautiful greenery in abundance and in good order. F1615v: Landscape with Peasant Women Harvesting, Van Gogh Museum. Van Gogh made no paintings of traditional peasant life, la vie rustique, at Auvers of the sort he had formerly made in Nuenen. His sketchbooks contain perhaps just half a dozen or so quick studies of peasant scenes, such as F1615v Landscape with Peasant Women Harvesting (right), as well as a rather larger number of studies of farm animals such as chickens and ponies. His subjects were landscapes, townscapes, portraiture, and still lifes. His paintings at Auvers imply a range of social domains. Thus his paintings of dwellings range from thatched cottages through to middle-class villas and finally aristocratic châteaus, and these are set within the social spaces of gardens, streets, and the vestiges of feudal domain respectively. During the months of May, June and July 1890, van Gogh was extremely productive. The letters give accounts of thirty-six paintings that can be dated with certainty to the Auvers period. The 1970 catalogue raisonné lists another fifty or so, of which some may date before Auvers and others may be inauthentic. Even the certain paintings imply a painting executed every other day over the two-month period. Van Gogh lodged at the Auberge Ravoux, where he remained until his death in the early hours of the morning of 29 July 1890 from a self-inflicted gunshot wound to the stomach. A postcard showing a farmhouse in Chaponval before 1914. The two thatched cottages at the left are set at right angles. They reappear in F780 Thatched cottages in Auvers (see below). Van Gogh was generally meticulous in his depiction of street scenes, a fact that allowed the precise location of the F766 White House at Night to be ascertained, an Auvers painting that was once thought lost but re-emerged in 1995 in the collection of the Hermitage Museum. Toledo Museum of Art, the holding museum, points to the structural juxtaposition of the blue-tiled roof and the adjacent thatched roof of the house. Vigorous brush strokes, varying in direction, are used to highlight the contrast and textures. By contrast, the trees and garden are represented in the characteristic swirling manner van Gogh developed at Saint-Rémy. Pickvance notes the color scheme is restrained in accordance with van Gogh's return to the North, but also in response to the weather conditions: the sky is laden with clouds and a poplar tree bends to the force of the wind. The paint is applied remarkably thinly in places, and there are bare patches of canvas. Van Der Veen & Knapp remark that at the time of writing (2010), the shutters still retained their original green color. On Sunday 8 June, Theo, Jo and baby visited Vincent and they all had dinner together at Dr. Gachet. The following Tuesday 10 June, van Gogh wrote to say he had since completed two more studies in "the greenery" (i.e. the suburbs). Hulsker thought these were most likely F758 Farmhouses in Jorgus with figures and F806 Farmhouse with two figures. [L 8] Van Der Veen & Knapp describe F758 as extremely crude, a reminder that not everything from a master is masterful, nevertheless pointing out the masterly economy of the figure on the right and the line of chickens to her left. By contrast the figure on the left is quite unfinished. Similarly F806 is unfinished in parts, especially at the lower right where there is bare canvas. The brushwork is indistinct and the sky lacks definition. F780 Thatched Cottages in Auvers depicts the thatch on a cottage being renewed. The location is the same one in Chaponval as F759 Houses in Auvers (i.e. the subject of this article), featuring the same house with a pointed roof and distinctive chimney (the leftmost house in F758 is the rightmost house in F780 seen at right angles). However, whereas F759 was painted shortly after van Gogh arrived in Auvers, F780 would seem to have been amongst the last of van Gogh's paintings, as he encloses a sketch of it (right) in his last letter to Theo of 23 July. [B][L 9] Both Hulsker and De La Faille date it July 1890. Both Pickvance and Van Der Veen & Knapp note that it is compositionally similar to F420 Row of Cottages at Saintes Maries painted some two years earlier on a day trip from the asylum at Saint-Rémy. Van Der Veen and Knapp describe F792 Thatched Cottages at Cordeville as characteristic of the village views van Gogh made at this time. The colors are subdued and no use of complementary colors is made. The location is quite likely 18 Rue Rajon (49°4′27.80″N 2°11′11.09″E﻿ / ﻿49.0743889°N 2.1864139°E﻿ / 49.0743889; 2.1864139). Hulsker places it amongst the earliest of the Auvers paintings. De La Faille notes similarities of location with drawing F1637r. Other paintings from this period are: F750 Thatched Cottages and Houses (for which F1640r above right is a study), F789 The Church at Auvers (another example of his return to the North), the size 30 canvases, and the double-square paintings. F793 Farms near Auvers is an example of a double-square canvas. F770 Landscape at Twilight is a view of the château at Auvers [fr]. It was the first of the double-square canvases and van Gogh described it in a letter to Theo of 24 June. [L 10] It was the only view he made of the château. The twilight is conveyed by heavy strokes of orange and yellow, but the sun itself is not seen. Nowhere in the Auvers painting did van Gogh directly depict the sun. Van Der Veen and Knapp note that there is a figure under the back pear tree, barely delineated in a few strokes. They describe the painting as a masterpiece of subtlety and form by a painter at the peak of his powers. F789 The Church at Auvers, a size 30 canvas, is described in a letter of 5 June to his sister Wil: "... It's again almost the same thing as the studies I did in Nuenen of the old tower and the cemetery. "[L 11] The study he was referring to was F84:The Old Church Tower at Nuenen, which he had already said he would like to redo as one of his "reminisces of the North" at Saint Rémy. [L 2] Hulsker remarks that The Starry Night is probably the only painting that matches it in its intensity of color and emotional charge. De La Faille gives the location of F791 The House of Père Pilon as 18 rue Francois Villon (49°4′13.02″N 2°8′40.12″E﻿ / ﻿49.0702833°N 2.1444778°E﻿ / 49.0702833; 2.1444778), midway between the Auberge Ravoux and 5 Rue de Gré. Père Pilon's villa was one of the grander modern villas in Auvers and is partly obscured in the picture by a large chestnut tree. In the letter Vincent sent Theo and Jo the day after his arrival, he said he found the villas of Auvers almost as attractive as the thatched cottages. [L 7] Pickvance says the picture may have been painted as early as 24 May and that the halo effect of the sky may reflect the wet and stormy weather van Gogh experienced on Saturday 24 and Sunday 25 May. Van Der Veen and Knapp point out a preparatory study F1638r (right) in the Van Gogh Museum. The location of F795 Village street and stairs in Auvers with figures is the Rue de la Sansonne directly opposite the Auberge Ravoux, though the stairs connecting the two streets are no longer there. There is a smaller companion piece F796 showing the same site whose authenticity Van Der Veen and Knapp question. A sheet of figure studies F1652r (right) has at its upper left a young girl seen from behind very close to the lower rightmost girl in the painting. The profile of a young girl to the right on the sheet is recognizably Adeline Ravoux, daughter of the innkeeper at the Auberge Ravoux where van Gogh lodged. She is the subject of portraits F768, F786, and F769. The young girl seen from behind is assumed to be her as well. As well as F795, she is thought to appear in a number of other paintings, including especially F819 Two Ladies Walking in a Landscape. The sheet fetched $4480,000 at a Christie's sale in 2007. F802 Village Street is a considerable curiosity as it was one of ten paintings exhibited at a Salon des Artistes Indépendants exhibition in 1891 a year after van Gogh's death. The catalog entry read Village (dernière esquisse) i.e. "Village (last work)". There is no mention of the painting in the letters and presumably its unfinished nature was responsible for calling it van Gogh's last painting. Pickvance notes the energy of the painting, betraying no indication of a tormented mind. Hulsker noted its lively color accents give it a cheerful aspect, to be found repeatedly in other paintings of the same sort at this time. Van Der Veen & Knapp think it was part of a series of views of the village made between the end of May and the beginning of June and that it is unfinished simply because van Gogh abandoned it, dissatisfied with the results he was getting. It has the distinction of being the first van Gogh painting ever to be purchased by a museum, the Ateneum purchasing it in 1903 from the estate of Julien Leclercq, who had organised one of the earliest van Gogh exhibitions. The Toledo Museum of Art purchased Houses at Auvers in 1935 with funds from the Libbey Endowment, the gift of Edward Libbey. The work had previously been owned by André Bonger of Amsterdam. The painting was first shown at the 1905 Amsterdam exhibition and has been since exhibited all over the world, including at the Metropolitan Museum of Art. ^ In particular any paintings he might have sold in Paris have gone undocumented as a result. Van Der Veen and Knapp point out that in a sense he sold all his paintings to his art dealer brother Theo, because that is what they contracted together in return for Theo supporting him with what was by the standards of the day a comfortable stipend. ^ A draft of this letter was found on van Gogh's body, but it did not differ significantly from the one Theo actually received. Nevertheless the 23 July letter was sufficiently out of character for Theo and Jo to correspond about it (Jo was in Amsterdam at the time). [L 9]:n.2 Hulsker says of Vicent's last letters that they are not exactly cheerful (he was beset with worries about Theo's health and future), but that they were not suicidal. Indeed the 23 July letter included a request for fresh paints. ^ "La Maison du père Lacroix, Auvers-sur-Oise". cezannecatalogue.com. The Paintings of Paul Cézanne, an online catalogue raisonné. ^ Laidman, Jenni (23 April 2001). "Wishing on Van Gogh's star". Toledo Blade. Archived from the original on 11 July 2015. Retrieved 8 March 2015. ^ "Houses at Auvers". toledomuseum.org. Toledo Museum of Art. ^ "Farms near Auvers, 1890". Tate Collection. Tate Museum Online. Retrieved 16 February 2011. ^ "Sale 1831 Lot 28". christies.com. Christie's. ^ "International collection". ateneum.fi. Arteneum. Archived from the original on 2014-03-09. ^ Frascona, Karen (14 February 2014). "Vincent van Gogh's 'Houses at Auvers' Voted Boston's Favorite Impressionist Painting: Unveils First 'Crowdsourced' Exhibition". Exhibition, Boston Loves Impressionism. Boston, Massachusetts: Museum of Fine Arts. Retrieved 6 March 2015. ^ a b "Provenance Report" (PDF). Ownership History for European Paintings (1933–1945). Toledo Museum of Art, Provenance Research Project. p. 3. Retrieved 8 March 2015. ^ New York, Metropolitan Museum of Art, Van Gogh in Saint-Remy and Auvers, 1986, no. 63, pp. 234, 235, repr. (col.). ^ "Letter 857: To Theo van Gogh. Saint-Rémy-de-Provence, on or about Monday, 17 March 1890". Vincent van Gogh: The Letters. Van Gogh Museum. 1v:2. I’m picking up this letter again to try and write, it will come little by little, it’s just that my mind has been so affected – without pain, it’s true – but totally stupefied. ^ "Letter 864:To Anna van Gogh-Carbentus and Willemien van Gogh. Saint-Rémy-de-Provence, Tuesday, 29 April 1890". Vincent van Gogh: The Letters. Van Gogh Museum. 1r:1. And while my illness was at its worst, I still painted, among other things a reminiscence of Brabant, cottages with mossy roofs and beech hedges on an autumn evening with a stormy sky, the sun setting red in reddish clouds. ^ "Letter 865:To Theo van Gogh. Saint-Rémy-de-Provence, on or about Thursday, 1 May 1890". Vincent van Gogh: The Letters. Van Gogh Museum. 1v:3. I’m almost sure that I’ll soon get better in the north, at least for quite a long time, while still apprehensive of a relapse in a few years’ time – but not immediately. ^ "Letter 875: To Theo van Gogh and Jo van Gogh-Bonger. Auvers-sur-Oise, 25 May 1890". vangoghletters.org. Van Gogh Museum. 1v2. Here we’re far enough from Paris for it to be the real countryside, but nevertheless, how changed since Daubigny. But not changed in an unpleasant way, there are many villas and various modern and middle-class dwellings, very jolly, sunny and covered with flowers. That in an almost lush countryside, just at this moment of the development of a new society in the old one, has nothing disagreeable about it; there’s a lot of well-being in the air. I see or think I see a calm there à la Puvis de Chavannes, no factories, but beautiful greenery in abundance and in good order. ^ "Letter 873: To Theo van Gogh and Jo van Gogh-Bonger. Auvers-sur-Oise, Tuesday, 20 May 1890". vangoghletters.org. Van Gogh Museum. 1r1. Auvers is really beautiful – among other things many old thatched roofs, which are becoming rare. ^ a b c "Letter 874: To Theo van Gogh and Jo van Gogh-Bonger. Auvers-sur-Oise, on or about Wednesday, 21 May 1890". vangoghletters.org. Van Gogh Museum. 1r4. But I find the modern villas and the middle-class country houses almost as pretty as the old thatched cottages that are falling into ruin. ^ a b "Letter 902: To Theo van Gogh. Auvers-sur-Oise, Wednesday, 23 July 1890". Vincent van Gogh: The Letters. Van Gogh Museum. 1v:2. ... I’m adding a croquis of old thatched roofs. ^ "Letter 891:To Theo van Gogh. Auvers-sur-Oise, Tuesday, 24 June 1890 1890". Vincent van Gogh: The Letters. Van Gogh Museum. 1r:1. Finally a night effect – two completely dark pear trees against yellowing sky with wheatfields, and in the violet background the castle encased in the dark greenery. ^ "Letter 879: To Willemien van Gogh. Auvers-sur-Oise, Thursday, 5 June 1890". Vincent van Gogh: The Letters. Van Gogh Museum. 1v:2. I have a larger painting of the village church – an effect in which the building appears purplish against a sky of a deep and simple blue of pure cobalt, the stained-glass windows look like ultramarine blue patches, the roof is violet and in part orange. In the foreground a little flowery greenery and some sunny pink sand. It’s again almost the same thing as the studies I did in Nuenen of the old tower and the cemetery. Only now the colour is probably more expressive, more sumptuous. Barr, Alfred H. (28 February 1967). Oil paintings by van Gogh in American museums. Vincent Van Gogh. Taylor & Francis, Routledge. ISBN 978-0-7146-2039-8. ISBN 0-7146-2039-4. Erickson, Kathleen Powers (1998). At Eternity's Gate: The Spiritual Vision of Vincent van Gogh. ISBN 0-8028-4978-4. ISBN 978-0802849786. De La Faille, Jacob Baart (1970). The works of Vincent van Gogh (3rd ed.). Amsterdam: Meulenhoff. Colta Ives; Susan Alyson Stein; Sjraar van Heugten; Marije Vellekoop (2005). Vincent Van Gogh: The Drawings. New York: Metropolitan Museum of Art. ISBN 978-1-58839-165-0. Van Der Veen, Wouter; Knapp, Peter (2010). Van Gogh in Auvers: His Last Days. New York: The Monacelli Press. ISBN 1-58093-301-7. Maurer, Naomi E.; van Gogh, Vincent (1999) . The pursuit of spiritual wisdom: the thought and art of Vincent van Gogh and Paul Gauguin. Cranbury: Associated University Presses. ISBN 0-8386-3749-3. Walther, Ingo F.; van Gogh, Vincent; Metzger, Rainer (2010). Van Gogh: The Complete Paintings. II. Köln London: Taschen. ISBN 3-8365-2299-3. Welsh-Ovcharov, Bogomila (1999). Van Gogh in Provence and Auvers. New York. ISBN 0-88363-341-8. ISBN 978-0883633410. "Houses at Auvers". Our Collection, E-museum. Toledo Museum of Art. Retrieved 9 March 2015. – includes bibliography.